Authorities of Jinan, capital of Shandong province, expect the city to develop at a faster pace to become a regional hub for finance, logistics and technological innovations. "Ranking third in terms of GDP among provincial capitals in the country, Jinan will make full use of its advantages in geography, talent pool and business landscape to improve its global competitiveness," said Wang Wentao, Party chief of Jinan. Wang is the former Party chief of Nanchang, capital of Jiangxi province, and of Huangpu district in Shanghai. After becoming the head of Jinan in March, he proposed an aggressive development plan for the city. "With a history of 2,600 years, Jinan has long been known as the political, economic and cultural center of Shandong. Now we should strive to further raise the city's reputation as a nationally or even globally renowned metropolis," Wang said. 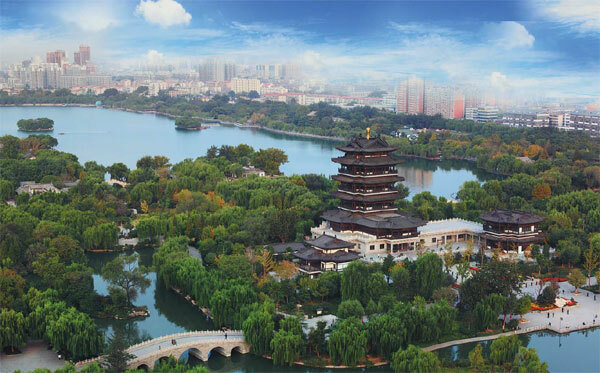 In 1986, the State Council named Jinan a national historical and cultural city. There are more than 800 natural springs that dot the city, giving it the nickname "Capital of Springs". Located about 500 kilometers south of Beijing and about 800 km north of Shanghai, Jinan is connected to the economic powerhouses through the Beijing-Shanghai high-speed railway, which shortens travel times to both cities by less than three hours. "We should better use our natural, cultural and geographic advantages to attract more overseas tourists and businesses, and boost the city's global competitiveness in sectors of commerce, finance, logistics and technological innovation," Wang said. In 2013, the Shandong provincial government implemented a regional development strategy that called for the integration of Jinan with its six neighboring cities: Laiwu, Zibo, Tai'an, Dezhou, Binzhou and Liaocheng. Authorities hope the move will provide the capital more economic opportunities. According to the local government's statistics, Jinan's GDP totaled 577.1 billion yuan ($92.9 billion) last year, a rise of 8.8 percent from 2013. Its fixed-asset investments totaled 306.3 billion yuan last year, a growth of 16 percent from 2013. Despite the global economic slowdown, the city's foreign trade value totaled $10.5 billion in 2014, a year-on-year increase of 9.6 percent. According to the city's development plan, its GDP is projected to reach 1 trillion yuan in 2020. By then, the city will have 5.5 million people living in its 400-square-kilometer urban area, bringing its urbanization rate to 72 percent. The plan said the city will continue to transform its economic structure, with revenues from high-tech companies accounting for 45 percent of total revenue by industrial enterprises. The city also plans to boost research and development to create a base for high-tech and advanced industries. "Advanced and emerging industries like information services, new materials, biomedicine and advanced equipment manufacturing will be the highlights of the city's development," said Wang. The city currently has about 10 industrial zones, including the State-level Jinan High-Tech Industrial Development Zone, the Jinan Economic and Technological Development Zone and the Jinan Comprehensive Free Trade Zone. A software park within the high-tech zone has generated more than 50 billion yuan in sales revenue annually in recent years. Approved by the State Council in 2012, the Jinan free trade zone stretches over 15 square kilometers and allows enterprises to have convenient access to trade services ranging from storage to customs clearance. The first of its kind in Shandong's central and western regions, the zone plays an important role in promoting an export-oriented economy for Jinan and its neighboring cities. Its pillar industries include logistics, integrated circuits and advanced manufacturing. Wang said Jinan is committed to promoting its financial sector and building a range of financial industrial clusters. The city is now home to more than 300 financial institutions. Its financial industry reported 54.2 billion yuan in profits last year, a growth of more than 16 percent from 2013. The Party chief said a central business district is under construction in the eastern part of Jinan, where there currently are more than 40 commercial projects with a total investment of 77 billion yuan. Projects include the 830,000-square-meter Mixc Shopping Mall, a commercial complex of China Resources Co, and the 318-meter-high Zhonghong Plaza that is designed to be the city's new landmark. "The CBD will focus on sectors of finance, banking, insurance, information service and trade. It is expected to become a financial and trade zone similarly to Lujiazui in Shanghai or Manhattan in New York," Wang said. The CBD development plan has attracted more than 450 companies, including Shandong Energy Group, Shandong Hi-Speed Group, the Shandong branch of China Life Insurance Group and the Jinan branch of Beijing Bank.